If someone sat you down and told you what foods were going to make you age faster, would you make the effort to avoid them? 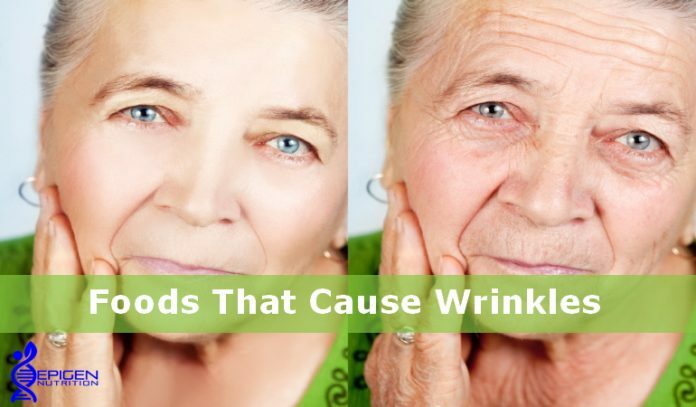 To be specific, I am referring to the foods that make the appearance of wrinkles and fine lines even more pronounced than they should normally be. It’s a fact that over the long term our diets can have a very profound effect on our complexions. If getting wrinkles is something that concerns you a lot, then you should be really thinking about how to slow them down a bit, rather than trying to cover them up or rubbing something in to temporarily disguise them. The cosmetic industry is now a multi-billion dollar industry, thanks in large part to the never ending search for a miracle serum that will hide the signs of aging. While it is not possible to get rid of wrinkles and lines (without surgery that is), there’s no reason why you can’t slow down this natural process as much as possible. Knowing this should be enough to motivate you to clean house of those youth sucking foods that are sitting in your pantry or cupboards right now. This bad boy is probably the most common culprit, and yet you can find it in just about everyone’s home. If you were to look through your food cupboards right now, you are likely to find some sort of snack, candy, pastry or other packaged food, which is packed full of sugar. Most of us are aware of the implications of sugar regarding our health when it comes to the likes of type 2 diabetes and obesity, but less is known about how sugar affects skin and can how it can aid in the formation of premature wrinkles. Sugar can actually increase the degradation of the proteins that give skin its youth and vitality, namely collagen and elastin. As these proteins are diminished the skin gets all saggy and wrinkles are formed. Can you think of any better reasons to get rid of these sugars from your diet? Although coffee contains nutrients that are beneficial to our bodies, as discussed in other articles here on Epigen Nutrition, it is not all that beneficial when it comes to helping with wrinkles. This one will be a major shocker for many people around the world, but the fact is that caffeine found in coffee can be responsible for the premature onset of wrinkles. We all know that coffee can perk you up and get you ready for a tough day; one of the ways it does this is to signal your body to produce more cortisol, the stress hormone. While this hormone does make you better equipped to deal with stress, a side effect is the fact that it breaks down collagen. I know that many of you feel like you would shut down without your coffee fix, but if you must have it, a better time to do so would be when your cortisol levels are lower, such as around 10am or 3pm. We know that it is good to eat meat (sorry veggie people), since the protein that’s in it helps promote recovery on just about all levels. On the other hand smoked and processed meats like deli cuts are a different ballgame altogether. All meat contains compounds known as AGE (advanced glycation end products) which speed up the oxidative processes your body. This is somewhat unavoidable, but meat that has been cooked at high temperatures possess extremely high amounts of this compound, which when consumed accelerates aging and destruction of cells. Alcohol is a dehydrating agent, meaning that it will remove water from your body. Then if this is constantly repeated, over a period of time these spells of dehydration will destroy collagen and elastin, making the skin all listless and wrinkly. It also produces a negative effect on how our body absorbs, uses, stores and excretes the vital nutrients our body’s need, which include those that are vital for our skins health. And if that wasn’t bad enough, alcohol increases the production of free radicals, which can not only cause damage to cells it speeds up the ageing process as well. Then to top it all off excess alcohol consumption can also cause those unattractive broken blood vessels (capillaries) that appear on the face, and you don’t want them dotted all around under the wrinkles as well do you? It takes a bit of effort to keep your skin youthful in appearance. But, following a healthy eating regime, plus making sure you have proper sleep and getting regular exercise is a lot easier than paying thousands for plastic surgery and then having to recover from it. If you take the time to make healthy choices each day, avoid unhealthy foods and excessive alcohol consumption your skin will eventually thank you for it.